There may be a way to thwart Albany’s truck-crunching trestle, but it would cost something. One way, of course, is to rely on drivers to pay attention. But that has not been 100 percent successful. In the most recent incident on Nov. 25, the railroad bridge on First Avenue bit the top off the Eugene-based delivery truck of a driver from Brookings. It was only the latest in a long series of similar crashes going back decades. The bridge has a clearance of 11 feet 4 inches. To alert drivers of taller vehicles, there are detour signs and a warning chain, and there also are warnings in some GPS systems, as a reader pointed out after the November accident. So what else could be done? Well, how about an automated warning system that detects over-height loads and activates a flashing light? The devices flash an alarm when an infrared beam detects a too-tall load coming down the street. Ron Irish, the city of Albany’s street transportation expert, looked into this possibility. Irish says there are two or three places in Oregon where these systems are in use, including the Highway 99E bridge over the Willamette River at Harrisburg. 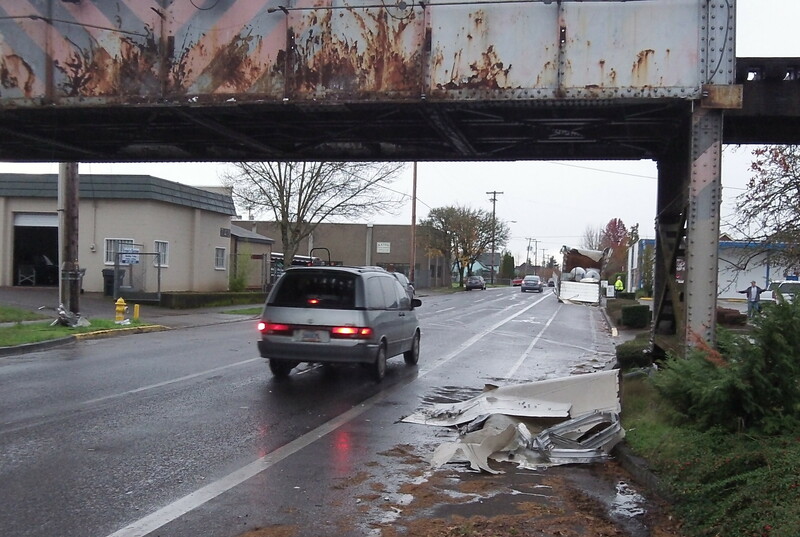 ODOT installed that one after a tall load damaged the bridge’s superstructure in 2010. Placing one of these systems on First would be up to the city. ODOT does not regulate them, and as long as it’s not installed on the bridge itself, the railroad’s OK is not required. How much would it cost? Irish says: “There is not a standard detail or specifications for their design. They are all custom installations, using off the shelf components. A 2010 article about the one in Harrisburg estimated that the construction cost was around $50,000.” The state evidently thought it was worth the expense, but it had an obvious interest in protecting the bridge and preventing big repair costs. You can put most any type of warning there and it still probably wouldn’t tame drivers stupidity! Best accident I covered there was the 10 yard full cement truck that split open on a hot day. Jim, Was that the one I commented on in the prior article? About 1972-73? If so, that concrete was headed to our construction job…….and it WAS a HOT, August day…..
All the warnings and such assume tall rigs are approaching a few blocks ahead while driving on First Ave. When approaching from the cross street a block away from the tracks there is no warning. My office is near this trestle and twice I have heard the sickening sound of that trestle eating metal. What about railroad crossing arms, complete with flashing red lights when they lower, triggered by a camera with a sensor that sees too-tall trucks not turning off onto Madison?